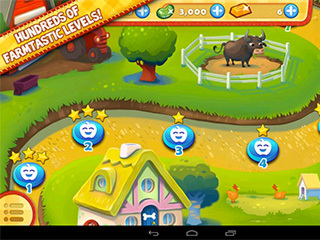 Farm Heroes Saga is a great way to have some fun on your device sa well as a great mind training. Surrounded by fruit and vegies you can train yourself to love those healthy options. Isn't everyone is focused on their diets these days? It's a match game, so you can expect a lot of activity matching and getting a higher and higher score. But there's more to focus on while you are matching. Well healthy food is not the real theme of this game though. You are playing on a farm and are trying to protect it from those who can harm it, like a villain raccoon. Your company of helpers is quite interesting too - a pig wearing goggles and a dog wearing galoshes. The graphics are very sunny and happy and sute. They are not necessarily girly cute, but rather funny cute apealing to all ages and both genders. Despite this happy look, there's a lot of trouble and work for you here. 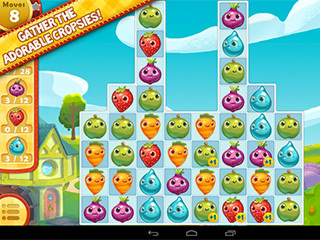 It's a match game, so you can expect a lot of activity matching and getting a higher and higher score. But there's more to focus on while you are matching. There are special tasks for you in every level. You should be able to harvest a certain kind of tile items within a certain number of moves. These tasks become more complicated as you get the tiles that need to be unlocked in some way. But there are ussually enough power-ups to accomplish the tasks, or you just get luchy! The game is very addicting as it challenges you wit those tasks. It is fun and brain teasing at the same time.